There are all sorts of bold statements — both for and against — using liquid fabric softeners and dryer sheets these days. Of course, those who advocate living a more environmentally friendly lifestyle typically avoid using fabric softeners and dryer sheets altogether, or they may advocate using only those that are made from all-natural products instead — like these natural fabric softeners and these natural dryer sheets . Besides the eco-friendly reasons to stop using fabric softeners and dryer sheets, there are also a number of misconceptions about these 2 popular laundry aids. The fact is: fabric softeners and dryer sheets do indeed make your clothes feel softer and smell better. And they reduce wrinkles too — especially if you line dry your clothes. If you’ve recently heard some warnings about the downsides of using fabric softeners and dryer sheets, then it’s time to sort out the facts from the myths. Following are some of the most common warnings about the use of fabric softeners and dryer sheets, combined with the facts — so you can make your own decision about whether you want to continue using them or not. #1 – Fabric softeners and dryer sheets lessen the life of your clothes dryer. It’s only true to the same extent that simply using your dryer lessens the life of your clothes dryer. That’s right, time itself is your dryer’s biggest enemy, not the fabric softener you use. Due to its mechanical nature, dryer parts simply become worn out and eventually break down over time. This happens faster than the time that would be needed for you to notice the effects of longterm use of fabric softener on your dryer. Any residue that might accrue from fabric softeners and dryer sheets can simply be removed with a brush or soap & water, without causing any damage to your dryer. As for buildup from fabric softeners or dryer sheets burning out the heating element in your dryer and/or causing dryer fire, there’s just no validity to this. Don’t skip times between cleaning out the lint trap on your clothes dryer. Even if there’s just a little bit of lint, it should be removed every single time between use. You don’t need to use more than one-half of a dryer sheet per load in order to avoid static cling, soften your clothes, and keep them smelling fresh. #2 – Fabric softeners and dryer sheets shouldn’t be used with microfiber towels. Liquid fabric softeners, as well as dryer sheets, will significantly damage the delicate fibers in microfiber. In fact, few people realize that microfiber towels should not be subjected to heat at all. Thus, not only are dryer sheets a problem, but the heat itself can wreak havoc on your microfiber towels. If you must dry them quickly, then choose a low- or no-heat option. Therefore, even though it can be difficult to remember to wash (if you use liquid fabric softener) and dry your microfiber towels separately from your other towels, it’s imperative that you do. Some even recommend washing your microfiber towels separately from your cotton towels, though I’ll admit I don’t do that. Perhaps the super-absorbent properties in my microfiber towels would be even better if I did though. Never use a liquid fabric softener when washing microfiber towels. Always make a point to air dry all of your microfiber towels, or simply tumble dry on low- or no-heat without using dryer sheets. Don’t use bleach with your microfiber towels either. It damages the delicate fibers that give microfiber its super-absorbing properties. Occasionally, to revive the properties of the microfiber, boil microfiber towels for 10 minutes. Adding a bit of vinegar to the water can also be beneficial. #3 – Fabric softener and dryer sheets shouldn’t be used with athletic sportswear, spandex & nylon garments. Fabric softener can reduce the ability of certain fabrics to manage moisture and breathe — including sportswear, swimsuits, shapewear, undergarments, and athletic gear with wicking properties intended to keep you dry and cool. The waxy softening agents in fabric softeners interfere with the garment’s ability to wick away moisture to keep you cool & dry (which is probably what you bought the garment for in the first place), so you should avoid using softeners with most sportswear. More and more clothing manufacturers are incorporating spandex (or elastane) into garments these days. It’s what gives your clothes some “stretch” (like leggings and jeans) and “control” (like shapewear and undergarments). So don’t think that because an item isn’t considered “athletic wear” that you’re in the clear. Think beyond the “sports & outdoor” label when you’re deciding which of your garments can be rinsed with fabric softener and which ones cannot. Bras and underwear also have stretchy components (typically consisting of nylon or spandex) that are likely to be weakened by the use of fabric softener. 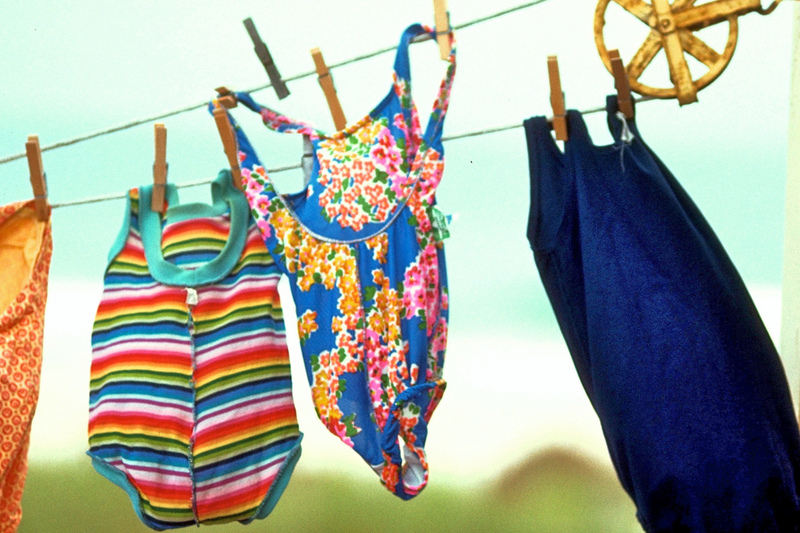 If a garment has spandex in it, don’t use fabric softener. If a garment has nylon in it, don’t use fabric softener. Don’t use fabric softener on sportswear that has wicking properties to keep you cool and dry. #4 – Fabric softeners can stain your clothes. That’s why most fabric softeners state right on the bottle that you shouldn’t pour fabric softener directly on your clothes. The fact is: when liquid fabric softener is used on certain fabrics (or fabric blends), oily looking spots or discoloration could result. A fabric softener stain looks blue-gray and greasy. While the risk of stains occurring is relatively small, it’s still a possibility. To avoid the possibility of fabric softener landing directly on your clothes and staining them in the washing machine, don’t overfill the machine with too many items. Doing so makes it difficult for enough water to circulate around the clothes and disperse the detergent and fabric softener equally. Here’s how to remove a fabric softener stain from your clothing (including stains from dryer sheets). Here’s how to remove fabric softener stains from various fabrics and surfaces. In case you’re wondering, switching from dryer sheets to dryer balls will not shorten the amount of time it takes to dry your clothes. #5 – Fabric softener can exacerbate — or even cause — body acne. There appears to be some truth to this one. While there is no scientific proof to validate this claim, a number of people have experienced body acne as a result of using fabric softener. Even some doctors have experienced body acne after using fabric softener on their clothes. The waxy softening agent in liquid fabric softener effectively clogs your pores. It appears to only be a problem with those that are super-sensitive. Since many laundry detergents already have fabric softener in them these days, adding additional fabric softener to your wash load (thus coating your clothing in it even more) could irritate your skin. If you have sensitive skin or you’re already battling acne, you should skip fabric softeners and dryer sheets altogether. #6 – Bounce dryer sheets repel mice. While certain smells will indeed annoy mice for a very short time, odoriferous things alone won’t keep them away. Therefore, the Bounce dryer sheets might work for a day or two, but then you’re just likely to have chewed up dryer sheets! Mice are attracted to places where light comes through. Period. That’s where they’re looking for food or a place to nest. Block holes and spaces that let light in, and you’ll be rid of your mice problem. Scent-based mice repellents aren’t the best course of action to rid yourself of a mouse problem. Even if the Bounce dryer sheets work for a short time, they won’t work for long. #7 – Dryer sheets should not be used with flame-retardant fabrics (like children’s clothing). The ingredients in fabric softeners and dryer sheets apply a thin, waxy coating to all fabrics — thereby reducing the flame resistance of fabrics which have been treated with a flame retardant. This commonly includes children’s pajamas, baby clothing, Halloween costumes and such. The truth is fabric softener and dryer sheets aren’t necessary items that you must have in your arsenal of laundry cleaning products. They’re merely a convenience. Be sure to read the label whenever you buy a new item of clothing. You might be surprised how many times it says Do Not Use Softeners! In the end, everyone has to make up their own mind regarding the use of dryer sheets and fabric softener. As we move toward a more eco-friendly world, environmentally-friendly alternatives are definitely becoming more and more popular.